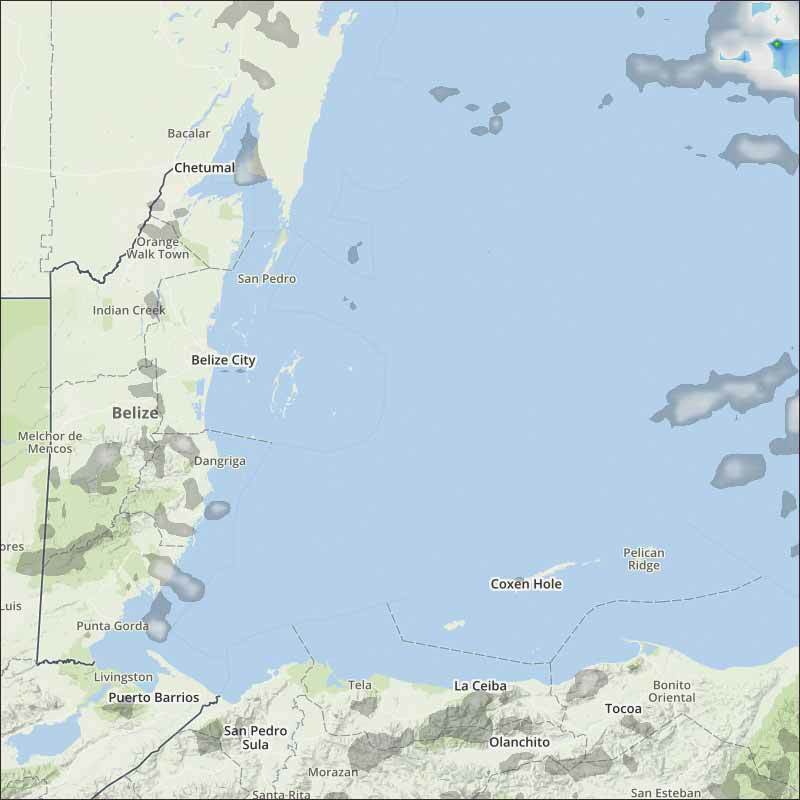 Belize NMS: Relatively moist conditions conditions continue over the area. 24-hour forecast: Sunny with some cloudy spells today and cloudy at times tonight. Showers will be generally isolated, along with the chance of isolated thunderstorms mostly over inland and southern areas. General Outlook: For Monday and Monday night is for generally isolated showers. Today E-SE 10-20 kts Choppy 3-5 ft A FEW SHOWERS OR ISOLATED THUNDERSTORMS MAINLY SOUTH. Tonight E-SE 10-20 kts Choppy 3-5 ft A FEW SHOWERS / ISOL THUNDERSTORMS MAINLY OVER THE SOUTH. Tomorrow E 10-20 kts Choppy 3-5 ft GENERALLY ISOLATED SHOWERS OVER THE SOUTH. Outlook E-SE 10-20 kts Choppy 3-5 ft MONDAY NIGHT:- FEW SHOWERS OVER THE SOUTH. 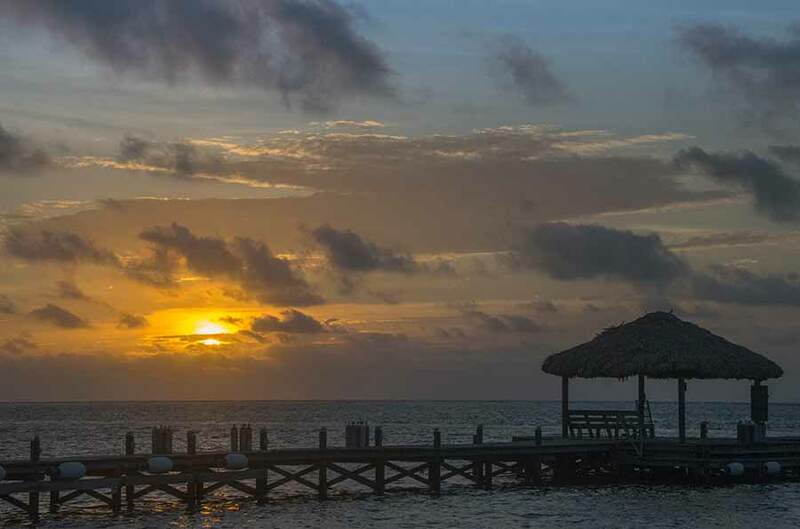 On Ambergris Caye this morning the wind is from the East at 8 mph and the sea is calm around our barrier reef. The sky is clear and today's expected high is 89 f.
The Cloud & rain picture. The easterly straggly Caribbean clouds are slow and turning towards the south in southern Belize. 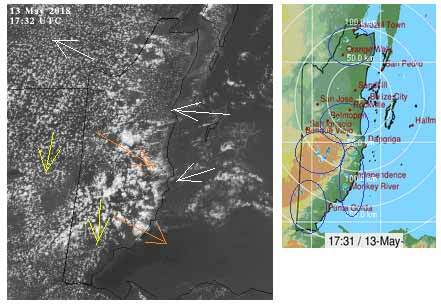 There is NW high level, clashing with the lower cloud, and there appears to be a general movement from the north, shown with yellow arrows. The clashing is already causing some rain. The rain is not moving in, but just developing around where it is.